I saw a guy called Sacrilege in game. Is he the same guy that runs this site? NEW Why are certain new features, bug fixes or improvements taking a long time to appear? All of the work done with this website is done in the owner's free time. I (Sacrilege) dedicate a lot of my personal time to maintaining and improving Dawnbase, but there's only so much I can do. I currently work a full-time position running a business, which is long hours (much more than a standard 40 hour week at times) and very draining. Add a social life on to that, friend and family commitments, as well as a new puppy in our family, and we end up with very little free time to myself. Part of that I devote to Dawnbase, but as you can imagine it's a very slow process given that I can only do a few hours per week sometimes working on the site. I put in as many hours as I can. I'd love to work on Dawnbase full time. It'd let me develop tons of cool new features pretty quickly, such as team recruitment, forums, perhaps even a model viewer. But at present there's simply no way I can afford to live off of the very small income generated by Dawnbase. The ads help a little, and they cover server costs, but they're certainly nowhere near enough income to allow me to work on Dawnbase full time. This is the primary reason I implemented the Premium system. Quite a few people had already asked how they could help contribute to the site, and I didn't like the idea of a donations system — with a Premium upgrade, people would get perks in return. That feels a lot more fair to me. It is my hope that eventually enough players will be on Dawnbase and happy enough with us to purchase Premium that the income will cover being able to commit fully to working on Dawnbase full time. Once that happens you'll see some amazing new things come to Dawnbase; things I simply (and sadly) do not have the time to work on fully at the moment. NEW Why do some of the champion animations show the backgrounds and others don't? This is to do with the techniques I use to pull champions out from their backgrounds. Due to the way the Infinite Crisis engine handles particles, champions with a lot of particles on them (such as the Lanterns) look extremely glitchy using the techniques, meaning I have to record them plain. I can't do anything about it unless Turbine gave me special client tools (unlikely!). I know my password is correct but I've never been able to log in. This happens when you didn't verify your email address. Check your email. I signed up on the site but never received my confirmation email. Help? This usually happens to people who use low quality free email accounts, like Hotmail or Yahoo. Their spam filters are too aggressive and probably moved your confirmation email into their Spam or Junk folder. Check those! If you still haven't received an email after an hour or so, contact us through the Submit a Correction page. Remember to include your username: it's amazing how many people tell us they can't log in, without telling us who they even are! NEW I'm trying to reset my password, but I'm getting a "Bad username" error even though I know it's right. You're entering the wrong email address associated with that account. Everytime we've had to fix this problem for users it has been down to them entering a different email address from the one they actually signed up with. NEW What are Promoted Streamers? How can I be one? Dawnbase users with a Premium upgrade can choose to be rotated among Promoted Streamers. NEW Some people have different color usernames... what's up with that? While regular Dawnbase users have orange usernames, those with an active BreezeBlue Premium upgrade will have a green username. Dawnbase staff have red usernames. NEW How can I be featured on Today's Guide? Write an excellent guide! Every day the site will pick the highest scoring guide that hasn't already been featured as a daily guide. Put together a great guide which people will enjoy, and you'll get high scores and ultimately featured on Today's Guide. When will you start showing champion or player stats? We're working directly with Turbine on this at the moment. We'll have some great stats coming soon! How can I get my stream listed? Members can add their stream to our streams page by adding their Twitch username to their profile. NEW Are you part of any large network? Although we're not part of a network such as ZAM or Curse, we're in the process of creating our own network of sites, each built and run with passion and quality you see in Dawnbase. Our network is BreezeBlue, and your BreezeBlue ID (formerly a Dawnbase username) will work across all of our websites. Is Dawnbase an official site, or made or endorsed by Turbine? No, we're not a Turbine-run site. We're a fully independent community. The awesome folks over at Turbine do approve of our work and tell us that we rock, which we really appreciate. How do guide and comment scores work? Headache answer: We use a modified statistical formula based on the lower bound of the Wilson score confidence interval for a Bernoulli parameter parallel to Bayesian inference as a binomial proportion confidence interval. Seriously. How do I earn Dawnbase reputation? How do I add tooltips, video or nice formatting to my guide? For a full list of all formatting codes available, visit the Dawncode page. How many people work on Dawnbase? Full time, one (Sacrilege), who has poured thousands of hours into all of the graphics, design and code. Noely supports him by feeding him and making sure he doesn't pass out on the keyboard. What happened to all of the cool datamining? We talk to Turbine a lot and have a bunch of personal contacts with them. One time we were talking, they basically asked us to stop datamining in order to prevent surprises, and we agreed. We'll still be the only place for exclusive info though, as Turbine will be giving us early information that you can't find elsewhere. Are you making a model viewer for the champions and costumes? Nope. We'd love to, honestly, but there are legal issues involved because of the DC license. Sorry! We're trying to come up with other ideas about how to best show off champion models and costumes. If you have suggestions, we'd love to hear them. 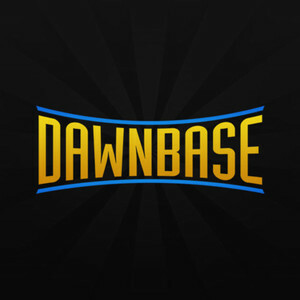 Can I show some love for Dawnbase on my site or stream? Absolutely! You can find a large version of the Dawnbase logo here. We're grateful for the support! Something is broken / I have a great idea for the site / What's the best way to contact you? Send us a message through our Facebook page, the submit a correction page, or send Sacrilege a PM. Seriously, if something isn't working right, tell us about it.